Experience Armenia’s historic sites and culture with enjoyable hikes through ancient landscapes filled with ancient cave monasteries, pagan temples, vineyards, petroglyphs, Silk Road caravanserais, artisan workshops and folk musicians – you will found a surprise at every corner! We explore the spiritual city of Echmiadzin, the iconic valley of Mount Ararat, and the beautiful forests of Dilijan National Park. Arrival at Zvartnots International Airport (landing middle of night, 00:40). Drive to your hotel/guesthouse (max. 20-30 min. drive to reach destination point). Early check-in. Rest. Breakfast. At 12:00 depart for the Yerevan city tour that includes all the major sights of 2800-year old capital: Victory park & Mother Armenia Statue, Cascade, the Opera house, Republic Square. From the Victory Park you will enjoy a panoramic view of the city that opens up breathtaking view with the magnificent scenery of the two ice-capped Mount Ararat, Swan Lake, Northern Avenue. Visit the State History Museum of Armenia, which is an ideal place to start your historical/cultural tour inside Armenia. Here you will see a collection of exhibits, illustrating centuries-old history of Armenian nation, from Paleolithic up to modern days. The world’s oldest over 5000-year-old shoe is also represented here. Lunch in the local restaurant. Afterwards head to Genocide museum which displays unprecedented international documents on Armenian Genocide, the first Genocide of the 20th century, carried out by Ottoman Turkey in 1915. After the museum tour, explore the memorial complex of Tsitsernakaberd dedicated to 1.5 million victims of Armenian Genocide. In the evening meet a local artist, who managed to restore traditional Armenian string instruments. Hotel/ B&B for the overnight stay in Yerevan. Breakfast. Visit Matenadaran, home to the world’s largest collection of Armenian ancient manuscripts. Head to Etchmiadzin, the centre of Armenian Christianity, which is considered to be the “Vatican” of Armenia with the Holy See of the Armenian Apostolic Church. Photo stop near the 7th century Zvartnots Cathedral (UNESCO World Heritage), which was excavated and reconstructed in the early 20th century. Continue to the Catherdral of Etchmiadzin/301-303 AD (UNESCO World Heritage), the first church of Armenia. Legend tells that it was here that Jesus Christ descended from Heaven to show where he wanted a church to be built. Etchmiadzin means “The Coming of Only Begotten”. Visit the Cross of Armenian Unity NGO and enjoy a typical Armenian lunch in this authentic cultural atmosphere. CAU is an education and support centre for the younger generation, which carries out a number of social outreach programs as well. Visit the Museum and Art Gallery of Armenian-American sculptor & artist Khoren Der-Harootian. Located in a former cinema house building this museum is a branch of National Gallery of Armenia. On your way to Yerevan visit Saint Hripsimé Church (UNESCO World Heritage), one of the oldest surviving churches in Armenia. Evening at leisure. Hotel/ B&B for the overnight stay in Yerevan. Drive through the industrial part of Yerevan – Ararat region where we will visit Khor Virap Monastery at the base of Mount Ararat. The monastery location gives the opportunity to enjoy a beautiful view to the biblical Ararat Mountain, were Noah’s arch cast an anchor. St. Gregory the Illuminator, the Baptist of Armenia, had been kept here in the basement during 13 years for the dissemination of Christianity. On the way to Noravank we will stop in Areni village which is famous for its variety of wines. Wine tasting at the wine factory. Lunch at a local restaurant or house. After lunch our next stop is Bird Cave located near the tributary of the Arpa River. The most ancient winery and the oldest leather shoe in the world was uncovered. We head to Noravank through Gnishik canyon enjoying exceptional views and photo stops. We reach to Noravank Monastery, an architectural gemstone nestled among brick-red cliffs, just above a deep gorge. We have a unique church structure here, a 3 storied mausoleum-church richly ornamented and extremely beautiful. After this we are starting our 3.5 km hike of moderate difficulty in Gnishik canyon following a serpentine trail. It is possible to observe bezoar goats, bears tracks, badgers, sky soaring vultures and eagles. After hiking back the car will take us to Syunik region for an overnight in Goris, a small city beautifully framed by high mountains. Dinner and overnight in a local B&B in Goris. After breakfast we set off for Khndzoresk located on the steep slope of a gorge and comprised of both natural and manmade caves, which used to be inhabited till the 1950s. We start our 3km moderate hike to this village on the gorge trail that will lead us to the churches of the St. Hripsime and St. Thaddeus. The hike will be finished by crossing the “Swinging Bridge” of Khndzoresk suspending across the gorge and connecting the old village with the new one. We will then move on to Halidzor village where you will take the longest cable car in the world – Wings of Tatev (5.1 km length). During the ride you will enjoy breathtaking views above Vorotan gorge and once at the top you will get to Tatev Monastery complex. After visiting the monastery we hike 6km through the wooded and winding trail of the Vorotan gorge. The Desert of Tatev (an ancient monastery, school, and one of the medieval cultural centers of the Syunik province) awaits its visitors in this gorge. Next on the route is the so called Devil’s Bridge, located over the Vorotan river. Locals claim that the water flowing underneath the bridge has healing influence. The trail ends at the Devil’s Bridge. Lunch in a local restaurant. Drive back to Goris. Optional night Goris city tour. Dinner and overnight in a B&B in Goris. Breakfast. Drive to Qarahounge, the Armenian “Stonehenge”. According to researchers, Zorats Karer could be among the world’s oldest astronomical observatories, and is at least 3,500 years older than British Stonehenge. Our next stop is Shaki waterfall being located in one of the coziest and nicest corners of Syunik province. Ughtasar hike starts at the bottom of the mountain after a 4×4 drive from the main road. The hike is moderate, it includes amazing views of the diverse landscape which is mostly rocky and isn’t rich of green areas, but it offers amazing geological diversity and the mountain itself is an ancient volcano full of water surrounded by rock art from ancient times. There is abundance of ancient petroglyphs here which are between four and seven thousand years old. Picnic lunch during the hike. After the hike we are heading to Vayk. Dinner and overnight in a hotel in Vayk. Breakfast. Drive to Shatin village, on the banks of the Yeghegis River, which is home to the only mountain goat observation point in Armenia. From those observation points we will have the possibility to see endangered bezoar goats. Continue our way to trace the historical Silk Route with the Selim Caravanserai. This unique architectural monument of Medieval Armenia is a splendid relic of the days when Armenia was at crossroads of economic, cultural and military affairs. Lunch en route. Proceed to Noratous village near Lake Sevan famous for an ancient cemetery which is the biggest cemetery housing qatchkars (cross-stones). Scenic drive along the pearl of Armenia, Lake Sevan. The lake covers over 10% of the countries territory. Experience lavash baking (Armenian traditional bread; UNESCO Cultural Heritage) as well as “brduj” master-class (local type of lavash roll with cheese and herbs). Dinner and overnight in a B&B in Sevan. After breakfast we head to Dilijan. We start our 10km moderate hike from the edge of Dilijan city along a newly-built trail through the forests of Dilijan National Park to Parz Lake. 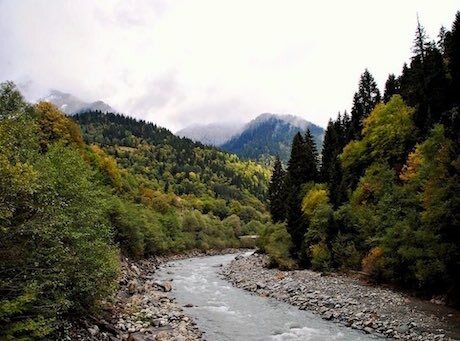 This route is a part of the Transcaucasian Trail, a long-distance hiking trail across the Caucasus, which continues in a southerly direction from Parz Lake to the village of Gosh, and in a northerly direction to Haghartsin Monastery. Picnic lunch en route. At the end of the hike we have an available cafe and different activities such as zip-line. The car is going to take us back to Dilijan Dinner and overnight in a local B&B in Dilijan. Breakfast. Drive to Yerevan. Optional: Hike in Dilijan or excursion to Master Levon’s Divine Underground. An interesting handmade cave not far from the city. For more info click here. Transfer to the airport. Departure (alternative arrangements to cross border with Georgia to Tbilisi possible).